I really love etched glass projects because they’re relatively simple to do (especially with the Silhouette) but turn out so beautifully. So when I spotted a frosted candle jar like this at the store, my first thought was, “I could do that!” and I set out to try. If you don’t have a Silhouette or Cricut, you can also cut vinyl by hand or look for a small decal you like on Etsy. *Be sure to read the directions and warnings on the etching cream before beginning and always keep out of reach of children. Make sure your jar is clean and dry. Prepare your decal using transfer paper and affix to the glass jar, smoothing out any bubbles. 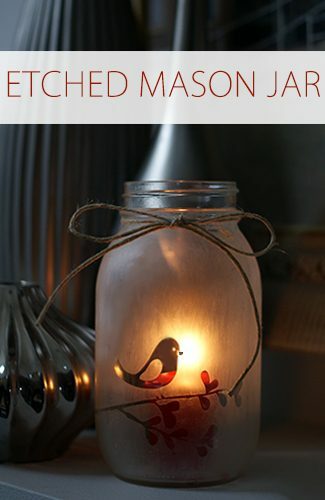 Cover the entire jar with etching cream, using long, smooth strokes for even etching. Rinse well, using a paper towel or rag to wipe off all etching cream. Remove vinyl sticker. Once dry, add a candle and a bow around the neck and you’re done! where did you get this decal?